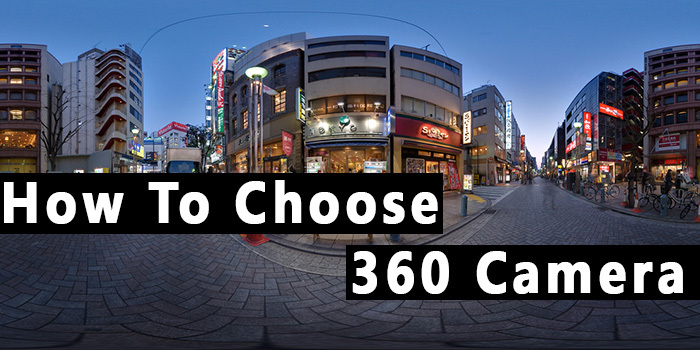 Taking 360-degree video becomes more and more popular with each passing day and if you are reading this article then you want to know how to choose 360 camera. Virtual reality content is used for entertainment, educational, and commercial purposes. Such video content is shot for commercials and feature films, and the fans take it to capture their travel and important moments in life, which they would experience again afterward with full presence effect. This technology exists for a long time, but has become popular just now. The thing is that now we have a set of channels for content delivery. These videos have become easy and convenient to watch – on the desktop, on a mobile device or through the VR glasses. For instance, when choosing 360 degree video camera you should know from the beginning how and where you are going to watch the videos. The essence of technology is simple: we shoot panorama, and it does not matter usual or video one, with a viewing angle of 360 to 180 degrees. Thus, the camera (usually two or more) sees everything around you. Each camera is shooting its segment. The number of cameras is very different, but the minimum number of cameras for 360 degrees video is two. Very often six cameras are used, because the more cameras involved in shooting, the greater the resolution of the final video will be. Let’s try to figure out what 360° video cameras are now available for purchase, as well as how to choose vr camera based on your needs and budget. Based on that all cameras can be divided into several segments: entry-level, middle class, and professional. Price, features, and purpose of the devices vary accordingly. 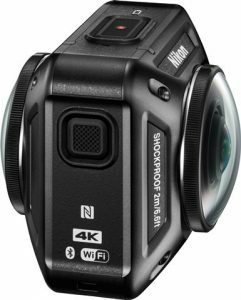 The entry-level category is represented by the cameras, which are ideally suited for those who want to shoot their first 360-degree video and understand what it is without spending a lot of money, time, and effort. It is expected that these cameras will not have the over-quality resolution, but this is a godsend for people want to have some everyday fun and save the precious moments in memory by means of 360 degree camera. A good example of the entry-level cameras is Amkov AMK-200S. Definitely, the resolution of 1920 x 960 may not be enough for professionals. But this small device with a weight of only 104 grams can give a user even more than a usual spherical camera. The developers equipped it with two lenses, which together make the total viewing angle of 720°. Along with this camera, there are Soocoo Cube360, Elephone EleCam, and DETU Wireless 360. Their price does not exceed $200. For example, a product of the Chinese company Soocoo Cube360 has a distinctive feature for its category. This device is both waterproof and shockproof, which the active users would certainly like. Devices of this type are very convenient to carry every day and use when needed. You will not be afraid that the camera will get wet or be broken. Initial kit includes various mounts, which is also well thought out. DETU Wireless 360 camera will surprise everyone by the simplicity of its use. By a simple push of a button, 360° × 236° panoramic lens will give a user 1080p full-HD video. A special app for any mobile device will help to control the camera. Elephone EleCam gives a higher resolution of 1920 × 1080 thanks to its dual 220° wide-angle fisheye lenses. As Soocoo Cube360 it has several types of mounts available in the initial kit of accessories. In general, pay attention to the entry-level cameras when choosing 360 degree video camera. Despite the potential problems with software and lack of extra high resolution, still, it is a great solution for enthusiasts, who want to keep up with the world of modern technologies. Different models in the price range of about $ 400 represent the middle class. Such 360-degree cameras are preferred by those video bloggers, who do the post processing of footage, or like to broadcast high-quality video directly on social networks, as well as people who understand, and for whom the resolution and other parameters of the shooting are important. In the middle range, it is worth taking a closer look at such cameras as Nikon KeyMission 360, Ricoh Theta S, Samsung Gear 360, LG 360 Cam, and 360fly 4K. The appearance and technical components of KeyMission 360 camera by the manufacturer of photographic equipment Nikon reveal the true purpose of the camera – filming extreme sports and entertainments. Here already appears a function of a built-in image stabilizer, which would be hard to find in entry-level cameras. It makes possible to shoot even in adverse weather conditions. Two wide-angle lenses with progressive CMOS-matrix produce a video recording in the highest UltraHD 4K quality with 24 FPS, which corresponds to the resolution of 3840 × 2160. Both Samsung Gear 360 and Ricoh Theta S have two lenses with an aperture of 2.0, due to which the picture becomes voluminous, and the devices are portable and easy to use. Special applications allow the users to see immediately the footage on their mobile devices. But in contrast to the Samsung model, Ricoh Theta S allows broadcasting your videos online. On the other hand, Gear 360 has a much greater resolution, 3840×1920 video and 25.9-megapixel photos against the FullHD video and 14-megapixel photos at Ricoh Theta S.
LG Corporation has not remained aloof from the production of VR-compatible gadgets and also released their spherical camera LG 360 Cam. The device is equipped with two wide-angle lenses, the synchronized operation of which provides a full 360-degree record of photos and videos. In the movie mode, these lenses are capable of recording video at maximum quality 2k (2560 × 1440). And if in the other similar models, the battery is sufficient for continuous operation of the camera for about 25 minutes, then with LG 360 Cam you can shoot as much as 70 minutes. This can be a great advantage for the travelers who may not always have a charger or backup battery with them. Timelapse fans will appreciate such model as 360Fly 4k by the company EyeSee360. The maximum resolution of the captured video is 2880 × 2880 at 30 fps. The built-in memory is designed to record several hours of video in the highest quality, and a fully charged battery will provide at least two hours of continuous recording. The middle class contains very worthy options for creating the 360-degree content. Remote camera control, including viewing, editing, publishing content, and much more – consider everything you need for the convenient use when choosing 360 degree video camera. All the best of the above-mentioned devices have absorbed cameras that belong to the professional range. If you’re picking up the camera for professional use, then Nokia OZO, Orah 4i, and Iris360 will be great options. They are specifically designed for the professional capture of virtual reality content. Iris360 should be separately highlighted, as it’s one of the first spherical cameras, officially licensed by Google to create and download 360-degree panoramas in navigation service Google Street View. Its high-sensitivity progressive lenses capture the finest details in the resolution of 8K. 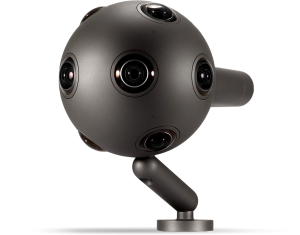 Nokia OZO is a spherical camera synchronized with 8 sensors and comes equipped with a stand-alone computer software OZO for broadcast and print preview. OZO also records audio in 360×360 format, and can broadcast streaming 360° HD video with the resolution up to 6K. But, the price of $45,000 seems justified not for everyone. As in other two cameras, in the development of Orah 4i, a highly sensitive sensor that can record video in excellent quality even in low light was applied. Professional optics ensure excellent image without distortion and other artifacts. Its main purpose is to stream a 360-degree content in the network. The gadget is equipped with four fisheye lenses, capable of producing video recording at a resolution up to 4K. In conclusion, we would like to say that today 360-degree cameras are used by extreme athletes, videographers, and indeed, the people having an active lifestyle. Also, these cameras are already used for commercial purposes for the installation of video surveillance systems in complex objects such as stadiums, hypermarkets, and etc. Most of the Internet resources integrate 360 video formats for uploading to their own websites. Thus, compact models, which do not require complex further processing will be an excellent choice if you just want to get acquainted with 360° technology and to shoot your entertainments, trips, or video blog. Choosing a more expensive advanced camera that requires additional fixtures and time-consuming post-processing is worth only if you have more serious intentions. Is the content, which I plan to shoot should necessary to be in the VR format? Where will I share it and how the others will watch it? How much money I am willing to spend and how will I edit the footage? Determined the answers to these questions, you will be able to significantly narrow the range of the camera to the most appropriate model.